Is there a way to restrict Agents from reassigning Tickets? This is a function of Agent to Agent security. Login to MailFlow and select Administration from the left menu, then Security,and finally Default Access Control. Select Agents, Edit. Note the default for Group Everyone is to have Delete Access to all other Agents. Set this value to None and All Agents (except Admins) will only be able to Assign to themselves and None, they will not be able to assign to other Agents. They have to be able to Assign to None as that is the behavior when a response is sent to an Inbound Message and the option to not route any responses to themselves is selected. Once you set the default security for the group Everyone's access to other Agents to None, you can then allow access to some Agents or Groups by selecting the New button and adding more lenient rights. 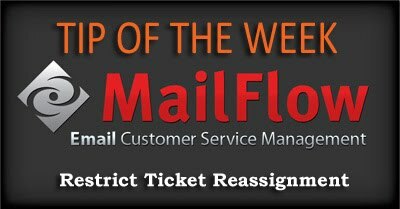 MailFlow always follows the path of least resistance, so if it encounters two or more rights that are in conflict with one another, it will always select the most lenient (less secure) right.